The point of reading the autobiographies of people who've done things you've never done is supposed to be to broaden your knowledge of the world. Actually, it's normally the case that the sole point is to gawp and gape. Which, of course, is absolutely fine - after all, someone's got to do the world's gawping and gaping. And these books very definitely fall into that category. Sheila Cousins' work is subtitled 'The autobiography of a prostitute', which kind of hints at the subject matter, but doesn't tell the whole story. For a start, note the date. As far as I know, this is the only serious account of prostitution in London in the early-1950s, just before the Wolfenden reforms changed the profession. Then again, consider the mythology of Soho at that time: a left-leaning literary London that was burning with impetuous impatience to change the whole of society. Ms Cousins was there and her accounts are amongst the most valuable - if the most neglected - that exist of the world from which the British artistic renaissance sprang. The memoirs of prostitutes have become more common since Ms Cousins, and often lack any wider interest, but this one really is a cracker. Quite apart from the stylistic beauty of the jacket design, the account of her career is gripping, illuminating and vital. Of course, this is not unrelated to the fact that ‘Sheila Cousins’ is generally accepted to have been a pseudonym, though who it was concealing is more disputed. Cecil Barr is one suggestion; Graham Greene and/or Ronald Matthews is another. You might also like to note that, despite the bibliographical information shown above (which comes from the edition I have), the first edition was actually published by Obelisk in Paris in 1938. Now I come to think of it, then, it's not really a book for gaping and gawping at all. However, the Memoirs of a Tattooist is beyond doubt good for a quick gape and gawp. 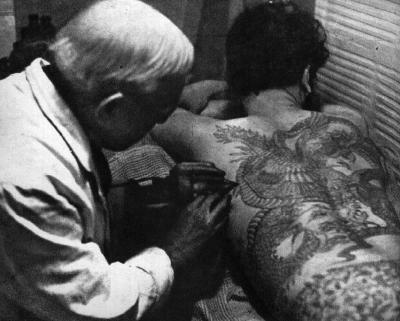 George Burchett died in 1953 at the age of 80, having spent his whole life dedicated to the art of tattooing. In the last months of his life, he was compiling notes for an autobiography, and after his death Peter Leighton completed the process, producing this memoir - written in the first-person but necessarily episodic. Curious stuff, but entirely unexplained, so you'll have to work out the motivation for yourself. The anecdotal nature of the book is supposed to interest us in the history of tattooing rather than sate our appetite. Didn't work like that for me, but I did like many of the stories, and I did enjoy the occasional glimpses of Mr Burchett's character and opinions. He tells us, for example, how senior members of the SS used to have the double lightning flash tattooed in their left armpit, and pauses only to remark: 'Very German, very silly.' Which puts them in their place. A more mainstream career, of course, was always available in the police force. William Prendergast spent ‘32 action-packed years in Liverpool’s CID’ and his experiences inspired a four-part TV series titled Jacks and Knaves, broadcast on BBC in 1961. Now almost entirely forgotten, that series nonetheless inspired in turn the hugely influential Z-Cars, which ran from 1962 to 1978 and dominated the TV portrayal of the police force until it was eclipsed by The Sweeney. The shift from this to Villain, just four years later, is instructive for students of recent British history. As indeed is the whole of the book and its depiction of life in Liverpool in the post-War period. Recommended.